Port Canaveral Transportation's reputation as Port Canaveral Preferred Transportation Service Provider is based on many years of experience servicing Port Canaveral and responding to clients' needs. The recognitions and endorsements (see below) received from our clients and our partners at the Canaveral Port Authority confirm our excellent service. In addition, Port Canaveral Transportation is the ONLY Transportation Company in the region - member of the BBB (Better Business Bureau). We offer luxury transportation from Orlando to Port Canaveral. 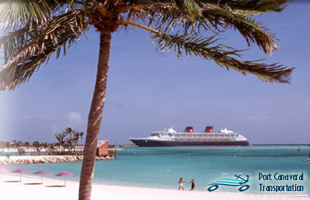 Port Canaveral Transportation will help you have a fantastic and memorable excursion. 1 Option: Staying at hotel near Orlando International Airport. Most of the hotels provide free shuttle transfer from the airport. Our clients however have indicated that they prefer to spend the extra day in a hotels near the Port Canaveral. - Residence Inn by Marriott (Not recommended - some negative experience has been reported by our clients. Shuttle service not very reliable).